The influence of various factors on the processes of nonequilibrium crystallization of dipeptide (DPT) from its aqueous solutions has been studied. The nonequilibrium crystallization leads to the formation of spatially heterogeneous structures. Depending on the charge of the DPT molecule (neutral or anion), not only the morphology of the surface of the layers changes, but also its electronic structure. The important role is played by the properties of the substrate-layer interfaces, which are responsible for the formation of ferroelectrics on gold during the crystallization of the DPT anion. The structure of the solid layers is also significantly affected by charges on the substrate surface, which can partially or completely compensate for the charges of individual functional groups in the PT molecule. The observed effects of bipolar resistive switching in peptide layers and the formation of ferroelectrics can find practical application as a smart material of memristor organic lectronics. The features of the structure formation of Al-Cu and Al-Cu-C materials under conditions of spark-plasma sintering under conditions of superposition of a direct and pulsating current at a temperature of 600ºC and a mechanical pressure of 60 MPa are studied. The obtained Al-Cu-C system materials with hardness from 400 to 1000 MPa, porosity from 3 to 1% are recommended for use as slip contacts, and also as antifriction materials in friction pairs either in dry (carbon-containing composites) or wet friction (composites not containing carbon). A theory of martensitic transformations of carbon steels based on the principle of detailed balance is proposed. This theory supplements the theory of Landau phase transitions in crystalline media, as well as the theory of crystallization of Kolmogorov’s and Avrami’s substance. In the proposed theory the martensitic transformations are described by the equations of induced transitions between two energy levels, which correspond to the number of particles of the initial phase with low energy (austenite) and the number of particles of the transformed phase with higher energy (martensite). The source of the transformations is the particles of the third kind – phonons, the number of which is associated with the induced transitions of particles between the energy levels and depends on the transformation temperature. The conclusions of the proposed theory correspond quantitatively to the experimental data. The effect of the low-frequency vibration processing on the residual elastic stresses in the Ti-6Al-4V alloy manufactured by 3D printing (Selective laser melting) was investigated. The studied sample was manufactured horizontally in respect to the building platform. Different vibration oscillations modes (vertical, horizontal, and elliptical) were chosen for study. The oscillations were done with frequency of 16 Hz, and a processing time was 20 minutes. Studies shown that 3D printed sample had a high level of residual elastic stresses, which were changed after vibration treatment. The optimal parameters of vibration processing, which provide a minimum level of residual elastic stresses in 3D printed Ti-6Al-4V alloy are discussed. The paper presents research on the development of ionizing radiation source of iridium-192 for gamma-ray flaw detector. Nuclear-physical processes of neutron activation of natural iridium on a nuclear reactor have been studied. Iridium disks were irradiated with neutrons of the VVR-SM reactor, radiochemical methods were used to reprocess iridium disks, hermetic sources of Iridium-192 were manufactured, The iridium-192 source was placed in the source holder and equipped with gamma-defectoscope (gamma-ray flaw detector) of Gammarid-192/120M. With a gamma-ray flaw detector with iridium-192 source, non-destructive testing of welded pipeline seam was carried out. X-ray photographs of non-destructive testing of welded seams were obtained, according to the sensitivity, which meet the requirements of the GOST-7512-82 «Control nondestructive control. Connections welded. Radiographic method». Cane chains are very important transmission elements which are carefully designed according to fatigue strength and wear resistance. To increase the life of cane chains, the resistance of the surface failure should be increased. In this investigation, experiments were carried out to evaluate the wear resistance using wear test rig designed and manufactured for this purpose. Three types of steels were used, namely 16MnCr5, 17CrNiMo6, and 18MnCrB5. Discs manufactured from these steels were carburized for different periods of time (6, 10, and 12 hours). Tempering process was carried out at different temperatures to obtain hardness values of 48, 52, and 56 HRC. The accumulated weight loss was measured and the wear rates were determined for each case hardened steel at the constant normal test load of 800 N. The accumulated weight loss was measured as a function of the number of revolutions. Wear rate was calculated and presented with case hardened depth and hardness for all steels. The hardness distribution and carbon content of carburized layer was presented as a function of the distance from the surface. Carburized layer microstructure and carbide percentage were presented and measured. From test results, it was concluded that the wear rate for all steels under investigation decreases with the increase of their case hardness. Minimum wear rate was obtained at hardness 56 HRC. Wear rate for all steels decreases with the increase of carburizing time tending to reach a minimum at carburizing time 10 hours. Wear rate for steel 16MnCr5 is less than that of the wear rate for 17CrNiMo6 and 18MnCrB5 by about 15℅ and 45℅ respectively under the same testing conditions. Carburized layer, carbon content and case depth increase with the increase of carburizing time. Electrochemical behavior of silver in tungstate-molybdate melts was studied by potentiometric and voltammetric methods. The electrode process was identified as a single-electron reversible one. The effect of silver on the electrochemical deposition of molybdenum carbide coatings and their electrochemical corrosion behavior in a sodium polysulfide melt was studied. 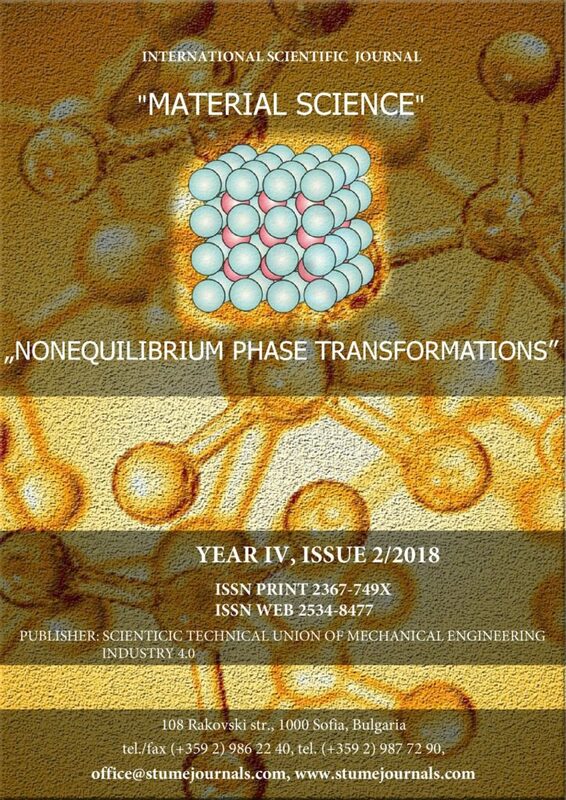 Methods for calculating the nonequilibrium phase transformations during the condensation of supercooled steam in the turbine flow path are developed. In the process of realization, the development of the classical Zel’dovich-Frenckel’s theory for the case of nonstationary nucleation of a new phase with fast extensions of supercooled steam is considered. A numerical-analytical method for calculating condensation was designed and implemented in the form of a software package, which consistently takes into account the nonstationarity of the process. Numerical studies have shown high efficiency and accuracy of the method.